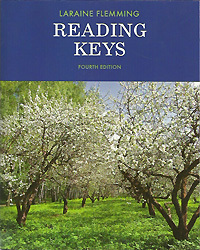 Instructors who have used previous editions of Reading Keys will be happy to hear that the fourth edition has many of the same features that encouraged them to choose the book initially. The fourth edition still uses a carefully scaffolded sequence in which each new skill builds upon previous ones, so that students never feel overwhelmed by new concepts and applications. Instead, they become, through the acquisition of each new skill, more independent and confident readers. As in previous editions, the first chapter identifies and models study strategies that encourage in-depth learning and remembering while the remaining chapters take students step by step through reading paragraphs to understanding and evaluating longer, multi-paragraph readings. New to this edition are a revised chapter on sentence relationships along with triple the number of visual images. Because so much research in cognitive science suggests that information makes its way into the brain by a number of different and distinct neural pathways, this edition includes many more diagrams and photos that provide visual illustrations of the verbal explanations. There is also a new discussion of how to evaluate websites and the inclusion of marginal think-alouds that model the thoughts of expert readers. At least half of the book's readings are brand-new and of those, a quarter are from popular textbooks. Reading 3: What Makes a Hero?